The cooler months have brought me in touch with my inner Domestic Goddess. The desire to nest and hibernate has revived a relationship with my kitchen. My stove, my pantry, my cluttered refrigerator, my Professional series KitchenAid mixer (the only really nice thing in my kitchen) - I've reacquainted with every nook and cranny. And it feels damn good. Methodically slicing, chopping, stirring and measuring helps remind me of stillness and a simpler time when our actions were examples of intentions, when kinder emotions ruled our motions. The simple act of making a soup from scratch gives me time to think about where my food came from and where it's going - an extension of that old marketing slogan, "Put good in. Get good out." I'd love to give my loved ones a million dollars and all their dreams served up on a silver platter, but sometimes a homemade something is even richer. My latest culinary experiment was an effort in summoning a sunnier season. A dozen Meyer lemons waited patiently inside my Green Bean Delivery, promising tart, lip smacking acidic singe. I winced at the thought of dredging my ragged, cracked cuticles through a bowl of biting lemon slices, but my taste buds knew the eminent stinging was just a means to an end. After a good bit of peeling, scraping, slicing and squeezing, I have two large glass jars full of my hard work. Little science experiments that will pay off in several weeks. In one jar, a bunch of almost-quartered lemons coated in coarse sea salt. The result will be tangy, salty preserved lemons perfect for preparing vegetables, fish and other savory dishes. I have more hope for the second, sweeter effort. I'm working on a homemade limoncello that needs four weeks of darkness to draw out the peel's essential oils. Beneath my kitchen sink, somewhere between the bucket full of dish towels and the dishwasher detergent, is a giant mason jar full of Meyer lemon peels and four cups of vodka. Every once in a while the jar gets a good shake to move the peels around a bit. Otherwise, it will sit there in darkness, enjoying its own winter hibernation. I intend to bring it back to the surface on Wednesday, March 20 - the first day of spring - to marry it with some simple syrup. The results will be utterly delicious. Gently peel the lemons to ensure you scrape no pith with the peel. If you do, go back and scrape off the pith with a knife. 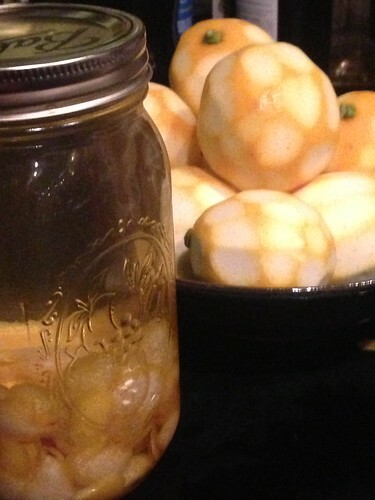 Put the citrus peels and alcohol in a mason jar and allow it to steep for four weeks. After four weeks, strain the mixture into a funnel covered with cheesecloth or a coffee filter. Meanwhile, stir together three cups of sugar and three cups of water in a sauce pan while on medium-high heat. Allow the solution to come to a boil and then turn down the heat for five minutes, bringing the mixture to a simmer. After another five minutes have passed, turn off the heat and allow simple syrup to cool. Blend strained solution and syrup in a bottle and seal and chill.